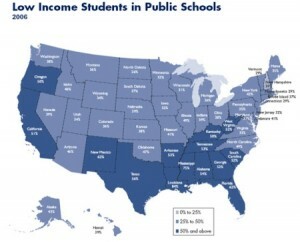 Students that come from privileged families tend to preform better in school than kids in disadvantaged households. 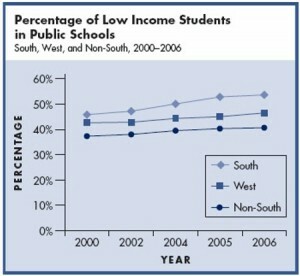 According to the results of the 2009 reading test conducted by the Program for International Student Assessment shows that students with lower economic and social status have lower test scores than their more advantaged peers in every country of the U.S.
“If the student comes from a low income family they have to worry about stuff at home and they feel like it’s their responsibility”, says junior Kali Herr. “I think it doesn’t matter if the student comes from a low income family because it depends on the persons work ethic”, exclaimed junior Aaron Lugo. One-fifth of American children live poverty which could be the reason why the U.S school system is falling behind compared to the rest of the world. At Penn Manor High School, 26% of the student body is living in poverty. The year before that the school was at 13%. For the past two years Penn Manor failed to make the AYP (Adequate Yearly Progress). According to America’s Children: Key National Indicators of Well-Being 2002, Children who live in a household with only one parent are substantially more likely to have family incomes below the poverty line than are children who live with two parents. They are also more likely to suffer from academic problems. The case seems to be that kids that are living in poor conditions are not capable of dealing with the effects of poverty. This contributes to students setting lower expectations and not believing in themselves. “There is more stress for the kid, and if they don’t have internet then they are screwed”, stated junior Bonnie Prebolla. p out with the family.This takes away from their focus on their school work. Research have shown that poor heath and nutrition yield a child’s development and learning. Early childhood plays a huge role in their education. Low-income students could of lacked some of these examples in their early stages. During the summer, poorer students experience greater learning loss than those who are more privileged peers who travel engaged in other enriching activities. After high school, people from stable families go to college and don’t have to worry about the price. Students who come from less advantaged homes tend not to pursue education after high school because the expenses are too much of a burden. “Since i have not been in that circumstance I can still understand that students that come from a lower income family that they wouldn’t do as well as a higher income student because they have to worry about things at home than focus at school”, said junior Meagan Miller. Family background does play a big factor in a child’s education.